How do I measure my door locks? This is one of the most popular questions we receive, and we've written many guides over the years on how to measure latches and locks, but we thought it was about time we put together a complete, all-in-one guide to help with measuring door locks; the ultimate guide that leaves nothing to question. Before we begin, we must first establish what type of lock you have in your door, so that you can be sure you're looking at the right section of this guide for your type of lock. Below is a list of different lock types. To make things easier, you can simply click on one of the locks below, and it will take you down to the relevant part of the guide. To correctly measure a sashlock, you will need to take six measurements in total. The most critical measurement is the backset, followed by the centres measurement and the case size. The least important measurement is the size of the faceplate, or 'forend', as this is normally not a critical size for installation, but can still be considered for aesthetic purposes (although bear in mind this will usually be hidden away when the door is closed). As displayed in the measuring diagram to the right, you will see that all of the measurements have been labelled appropriately with the letters A through to F.
The case depth is what would commonly be referred to as the 'lock size'. Whilst not all locks follow the same template, nine times out of ten, other measurements can be correctly assumed based on the case depth. There are many different case depths but the most common sizes are 64mm and 76mm. This is the metric equivalent to 2.5" and 3" lock cases from back in the imperial days. The backset measurement is the distance from the centre of the keyhole, to the leading edge of the lock. This is very important when replacing locks because you don't want to have to drill new holes if you can help it! The most common sizes here are 44mm (on a 64mm / 2.5" lock case), and 56mm (on a 76mm / 3" lock case). This dimension varies more than the previous two depending on the manufacturer and specification of the lock. Commercial DIN style locks will have a very large case due to the separation distance requirements of the keyhole and handle (more on this below), while others may be a little as 100mm (10cm). Similarly to the backset, this is a term you would not necessarily understand if you're not in the lock trade. This is the distance between the centre of the follower (the square hole the spindle passes through for your handles), and the centre of the rounded part of the keyhole. This is very important as you don't want to be drilling more holes or replacing handle sets! This is fairly self-explanatory and is as straight forward as measuring the width and height of the face that is visible on the edge of the door once fitted. It's mostly aesthetic, but can in some instances be critical, for example on metal doors. Once you've got all of your measurements sorted, you can click here view our complete range of mortice sash-locks. Measuring a deadlock is easier than measuring a sash-lock, because there's no handle alignment to worry about. As seen in the labelled diagram on the left, we have the letters A through to F which relate to the measurements below. The case depth is often simply stated as the 'lock size'. There are many different case depths but the most common sizes are 64mm and 76mm. This is the metric equivalent to 2.5" and 3" lock cases from back in the imperial days, you may well have heard the term "3 inch lock case" and so on.. The backset is an important measurement as it specifies the distance from the face of the lock to the centre of the keyhole. This allows you to correctly line up with existing holes in the door rather than drilling new ones. The most common sizes here are 44mm and 56mm (give or take a few millimetres). Some manufacturers measure with the finishing faceplate left on, whilst others measure it without. So by all means take measurements with and without the faceplate and you will soon see one of them matches the purchasable options available. This varies a lot based on manufacturer and age of the lock. The height is smaller on deadlocks than on sash locks for obvious reasons; there is no follower or latch to be housed in the case. So this is usually somewhere near the same as the case depth, appearing fairly 'square' in size. The size of the faceplate is not usually critical, but it's always better for a clean finish to match up with your existing locks when possible. Failing this, you can go for a larger forend size, allowing you to cover up the markings left from the fitting of the previous lock. 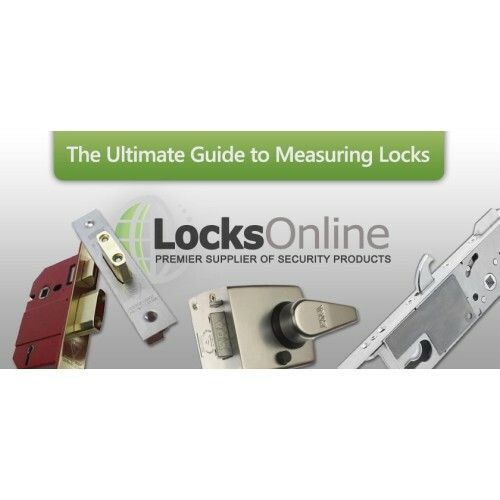 Once you've got all of your measurements from here, you can then browse our full range of mortice deadlocks by clicking here. Measuring a rim nighlatch (or "Yale Lock" as we all commonly call them) is very easy. There are only really three measurements you need to know, and only one of them is installation-critical. The case depth on night latches is not as important as on mortice locks, because they sit on the surface of the door, they are not fitting inside anything. However, it is of course important when you have a panelled door, that they fit on the stile (the thicker parts of the door around the edge). This is the distance from the front edge of the lock to the centre of the handle pivot inside or keyhole outside. As with all locks, the backset measurement is essential to get right, perhaps more-so on these types of locks than others, because you cannot usually afford to modify the existing hole in the door as they are quite large holes. Luckily though, there are only two common backset measurements here - 60mm and 40mm. There are others such as 50mm, but these are much less common. The case height is as it sounds, it is the height of the lock case that sits on the inside of the door. This is not critical in terms of installation but you should try to match it up to avoid any markings or damage from the previous lock being visible. Size tends to be dictated by the level of security and functionality offered. Older traditional style Yale locks will often be 'slimmer' than modern high security models. Got all of your measurements? Now you can check out our full range of rim nightlatches! The PZ Centres measurement is the distance between the centre of the keyhole (the rounded part), and the centre of the follower (the square hole the handles' spindle goes through). It is possible you may have two square spindle followers, this is referred to as a twin-follower lock, and in this case, you should take both measurements, each from the centre of the rounded part of the keyway. A typical single-spindle multipoint lock would have a 92mm PZ centre measurement, whilst the most common twin-spindle multipoint lock setup has 62mm and 92mm PZ centres. Exactly the same as with all locks, the backset measurement is the distance from the front face of the lock, to the centre of the keyhole and/or follower (on multipoint locks these are always in line so both should measure the same). On multipoint locks these are normally in 5mm increments, such as 30mm, 35mm, 40mm, 45mm, 50mm and so on. However, some older models may see smaller increments below 30mm, a typical example being the old 28mm backset GU multipoint locks. This is the distance from the square follower to the centre of each of the locking points (yours may have more than two). If you have a twin-spindle setup as mentioned above, then take both. This is because different manufacturers will measure from different points. Some may even measure from the centre of the keyhole, but if this is the case, you can always add the PZ measurement taken in label A to make up the difference. Similarly, if you have a twin spindle gearbox and did not take both distance measurements, you can add (or subtract) the difference between the two PZ measurements to make up the difference (ie, if you measured to the top follower, but the lock you're looking to buy measures to the bottom follower, and the PZ centres are 62mm and 92mm, you could add the difference [30mm] to your measurement). The metal strip that runs along the edge of the door and holds all of the locking points in place is known as the 'locking strip' or 'lock rail'. The length is usually not critical, because they are mostly designed over-sized, to be cut down to suit your door. If you have radius (rounded) edges though, then this becomes a bit more sensitive. The width is more important. This varies, but is typically 16mm for uPVC doors, and 20mm for wooden and composite doors. These are normally all flat, but some european multipoint locks have curled sides, this is known as a U-Rail. 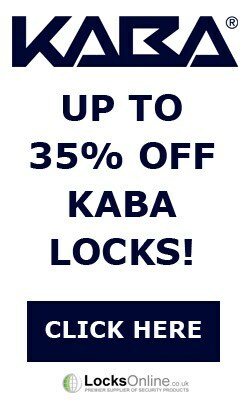 Now that you've got all your measurements, you can head over to our vast range of multipoint locks and find the right lock for your door! This is the overall depth (or length if you like) of the horizontal lock body. This will invariably be the largest measurement of them all with most horizontal locks, with the exception of some which have very tall face-plates. This is measured with or without the detachable faceplate depending on the manufacturer, so it is generally advised to allow for a tolerance of the thickness of the faceplate, either plus or minus depending on whether you've measured with or without the faceplate. Since the keyhole and square spindle follower are aligned horizontally on this style of lock, rather than having the backset measurement and a centres measurement, you simply have two backset measurements. So you would measure the distance from the front face of the lock to the centre of the keyhole, then again from the front face of the lock to the centre of the follower, giving you two individual measurements. For example you may end up with a reading of 57mm to the keyhole and 106mm to the follower. This is as straight forward as it sounds, simply measure the height of the lock - that is, the lock body itself, not the front plate! The front plate that sits on the edge of the door once the lock is fitted, is referred to as the forend or faceplate of the lock. Again, this is a simple case of measuring the width and the length of the plate, so you can try to match it up as close as possible for a clean finish on the door. Got all your measurements now? 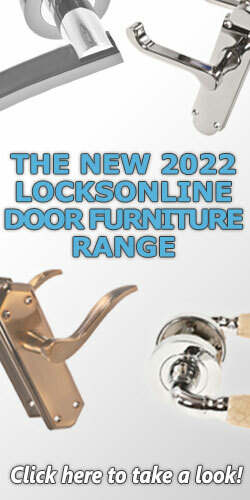 Take a look at our range of horizontal mortice locks now! This is often ambiguously and fairly misleadingly referred to as the 'case size'. It is indeed the overall size of the latch from front to back, but more importantly, is a critical measurement due to it being the overall depth that is going to sit into the door stile. Whilst there is no keyhole to consider on a mortice latch, you still need to consider the backset of the follower for the handles or knobs you have on the door. To avoid chafing or having to drill new holes in your door, make sure you measure accurately the distance from the front face of the latch, to the centre of the square hole for the spindle. Nice and simple, this is just the height of the case. But don't confuse this for the length of the face plate! The case height should be the height of the lock body only. The front plate that sits on the edge of the door once the lock is fitted, is referred to as the forend or faceplate of the lock. Simply measure the length and width so you can match up as best as possible for a clean finish on the edge of your door. 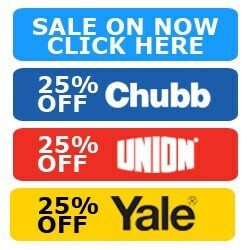 Now that you're all sorted with your measurements, you can browse our range of tubular latches & flat latches by clicking here. Any further questions? Please contact us and let us know!